In buttered baking dish, bake squash cut side down in 350 degree oven for 35 minutes. Melt butter in saucepabe, stir in rest of ingredients. Turn squash cut side up, sprinkle with salt, divide cranberry mix among them. Bake 25 minutes or until tender. Acorn Squashes-- halved Fresh cranberries - halved Grade B (dark amber) maple syrup Butter Spices: cinnamon, nutmeg, cloves Follow instructions above but don’t melt butter. This is a lovely and simple dish to prepare that uses an indigenous fruit, cranberries. Loring had initially sent us a recipe that she thought was her Aunt Laurinda’s, but as it turns out, Loring had altered the recipe. The recipe we made on TV is her aunt’s but I included Loring’s adaptation as well. The message - it’s OK to make changes, experiment or substitute ingredients. By slicing a small portion of the bottom of the acorn squash you prevent the squash from being tippy. Loring warns us that lopping off too much, however, can cause a leaky boat! 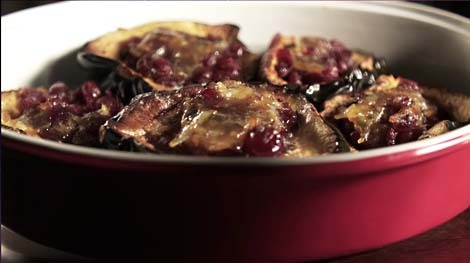 You can also use the acorn squash boat to hold any ingredients. I've done them with raisins, walnuts, maple syrup and a dab of butter.